The romance of flight is often associated with the dramatic landscape of tarmac and runways, where planes prepare for take-off. Humphrey Bogart and Ingrid Bergman say their last words to each other in a weird foggy glow on the taxiway in the closing minutes of Casablanca. A Lockheed 12 aircraft looms behind them, promising adventure. This is a threshold of escape -- a point of departure for the characters, an apt space of closure for the film. Woody Allen paid homage to this scene -- if also making it the subject of postmodern pastiche -- in his 1972 film Play It Again, Sam, recast with Diane Keaton and Woody Allen, and a modern San Francisco International Airport standing in for the exotic airfield of Casablanca. When I began working for United Airlines at the airport outside of Bozeman, Montana (BZN) in the spring of 2001, the tarmac pulsed vividly with romance prior to boarding. After passengers gave their boarding passes to agents like me, they would trundle down two flights of stairs that then emptied onto the windswept asphalt, our Canadair Regional Jet waiting for them fifty feet away, gleaming in the sunlight. Ramp workers, festooned in fluorescent vests, were positioned on the tarmac to guide the passengers toward the aircraft’s door-stairs, and to prohibit errant passengers from suddenly sprinting across the open expanse. There was something about the sight of passengers staggering out to the plane, in all types of weather and against the steady whine of the jet’s auxiliary power unit, which brought a spirit of adventure to this utterly routine practice. During the second year of my tenure at the airport, construction had begun on a new jet bridge for our United flights. A laconic French-Canadian crew set up shop on the tarmac and started to work on this strange new growth, a long metal tentacle dangling off the old familiar terminal corner. When the jet bridge was complete, I learned how to maneuver it on its jerky pivoted arc, how to extend and retract the tunnel, and how to project the accordioned flexion of the weather canopy over the top of the aircraft. There was a shrill klaxon that went off intermittently whenever the jet bridge’s main power was turned on; this caused an eerie ambience of emergency to hover around the tarmac, even when nothing was wrong. I learned about the auto-leveler, that little rubber-edged disc that hangs over the edge of the jet bridge and touches the plane: as the plane fills with passengers and luggage, and so gets heavier, the disc turns ever so gradually, keeping the jet bridge level with the plane. Because our planes were regional jets, we actually had to use a small metal bridge designed to fill the gap between the jet bridge and the small plane -- so, a miniature jet bridge that extended the jet bridge. This required an extra stage of training that was quite nerve-wracking, for the heavy connector was cumbersome and sharp-edged, and could easily damage the fuselage if jostled or hastily set up. I can still conjure the clanging vibrations of the metal stairs that lead down from the jet bridge to the tarmac, the empty thud of its floor as I sprinted down from the boarding area to check with the flight crew to see if they were ready for their passengers. I recall the lilt of the carry-on cart and the awkward angle of pull required so that it wouldn’t clip my ankles or spin out of control near the plane. The jet bridge is rife with so many low-tech moments -- when all the elaborate communication systems must be assisted by face-to-face affirmation, when the precision of jet flight is aided by wobbly plastic wheels, simple inclines, and human muscle power. Reminiscing, I recently looked down on the Bozeman airport from the satellite view on Google Maps. I noticed that the terminal now has several more jet bridges hanging off of it. Free-range tarmac boarding and deplaning looks to have become a thing of the past at this airport, another myth of the Wild West rendered obsolete. It’s ironic that Woody Allen used SFO to echo the famous tarmac scene from Casablanca, since by 1972 airports were well into the jet age, with bridges outmoding tarmac boarding. In fact, SFO was the first airport in the country to install jet bridges, in 1959. On the other hand, plenty of airports still board their aircraft in the original crude way, passengers schlepping across the blasted asphalt on the way to their planes. These two forms of boarding co-exist, but tarmac boarding has become but a signal of regional esotericism or infrastructural destitution, rather than a necessary and seductive encounter with the hot, loud realities of air travel. It may sound like a minor matter among the more pressing concerns of safety and security, new aircraft systems, and airline mergers over the past fifty years. Running to catch a connection, no one laments finding a jet bridge upon arriving. Today, that familiarity and expectation has made the jet bridge disappear into the background, an unconsidered if vaguely necessary space. But like the smartphone touchscreens its passengers fondle while queued up inside it, the jet bridge is hardly a transparent interface. It shapes our experiences of flight. What is it? A jet bridge is a machine attached to a building, a machine that connects another machine (the airplane) to the structure of the airport itself. A jet bridge is part of an airport, but it also extends the airport, supplements it. It guides movement and facilitates the efficient loading and unloading of passenger aircraft. It is a passage, a narrow hallway. Sometimes it can be quite long and labyrinthine feeling -- even when you know exactly where it begins and ends. It can feel old school and well worn, adorned with retro color palates and classic aviation motifs; or it can be sleek and new, plastered with the latest promotional materials for platinum credit cards and elite frequent flyer programs. In some ways a jet bridge is the most concentrated form of an airport, the purest interstitial zone that mediates your leap into the sky. It shines with utter simplicity and directness, perhaps at the beginning of a long-awaited trip; or it can lead to an onslaught of existential horror, such as when boarding is taking too long and the hundred-degree heat outside seeps in, suffocating. Conversely, a jet bridge can be a brutally frigid ice cave, shattering the fantasies of climate control so carefully maintained by airport concourses and aircraft cabins. A jet bridge can seem ominous or inviting, a point of departure or a point of no return. Paul Thomas Anderson riffed on this ambiguity in a pivotal scene of the 2003 film Punch Drunk Love, when Adam Sandler’s sheltered and volatile character Barry lopes down the jet bridge in a protracted slow motion shot, lumbering into an uncertain future beyond, as if this act will change the character’s fate forever. In Punch Drunk Love the jet bridge is an overdetermined vehicle for character development: we see that he’s going somewhere, all right -- even if it is just down a dank tunnel to a waiting airliner. The jet bridge blurs the edge of air travel. It numbs our sensations just before we enter the sublime object of flight, the airplane. The jet bridge is a haven from the elements, but is also the epitome of a “non-place,” or a space designed strictly to be passed through, zones which oddly come to define contemporary life (others include ATMs and rest stops). It is as if the airport, having successfully defined the modern experience of forgettable time and space, then produced its own derivative non-place -- the jet bridge. For how many business travelers and frequent flyers is the jet bridge an automatic and unconscious route, regardless of where in the world they are? Like a nested Russian doll, the jet bridge is a smaller version of the more generic architectural features of terminals and concourses: it reproduces the long march before flight, in condensed form. The philosopher Michel Foucault might have called the jet bridge a “heterotopia”: it is a placeless place unique to our historical moment, and a realm that secrets things away. The jet bridge puts the final moments and movements between the airport and the airplane out of sight. 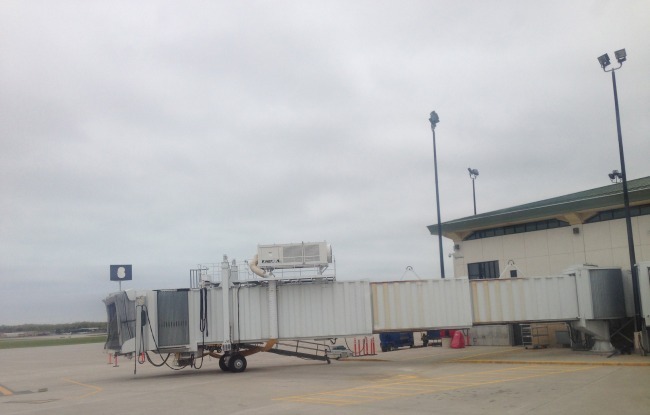 Most jet bridges are constructed out of sheet metal siding, and include no windows. There do exist a few glass-walled jet bridges -- but even these terminate in an enclosed endpoint. From inside the airport, then, you cannot see passengers take their final steps to, or their first steps off, an airplane. Likewise from a window seat in an airplane, or from on the ground -- say, from the vantage point of a baggage handler. Think of all the turbulent feelings, last looks, and signs of glee or resignation that occur right there, on the brink -- and it’s all kept under wraps. You might be visible to -- and be able to see -- your fellow passengers, perhaps. But even then, there is a tacit code of silence, incommunicado, that we all take in these sterile passages. Move it along, move it along. Certainly, there are obvious pragmatic reasons why these tunnels and tubes are enclosed and generally windowless; but nevertheless this shielding function has implications, adding a mystique to this space -- if not at all the same kind of mystique evoked by the exposed tarmac of Casablanca or Play It Again, Sam. On April 7, 2013, a jet bridge collapsed in Hong Kong, ripping a door off the Cathay Pacific Airbus A330 attached to it, which had just finished boarding. The specifics of this incident remain somewhat nebulous, but in any case the collapse did not result in explosions, serious injuries, or fatalities. Reading about this incident, among conjectures and speculations about what caused the structural failure, I was struck by a particular comment: a reader quipped, “these jet bridges sometimes have a life of their own....” What could this possibly mean? Certainly the author of this comment did not mean it literally -- and yet, there is a mystery worth tarrying with here, a specter of autonomy and agency. What if we were to take this curious insight seriously: that each jet bridge has a life of its own? After all, not only do these things exist collectively in our cultural imagination as predictable and functional airport spaces; they also have their own unique lives, and they collaborate with us as we pass through them, as we operate them, as we design and build them. For one group of jet bridge operators, it may initiate a bonding experience, and even take on a kind of character of its own. To a closed circuit camera during a tsunami, a jet bridge might appear as a stalwart appendage of the airport as other loose things are washed away. For strangers flirting in the boarding area, the jet bridge becomes a charged corridor full of suspense before the tyranny of seat assignments squelches whatever chemistry took place in the jet bridge. The jet bridge is far from the neutral accessory to the airport that it might seem to be. It is something in the world that we have to reckon with, something we make, and something that makes us in turn. 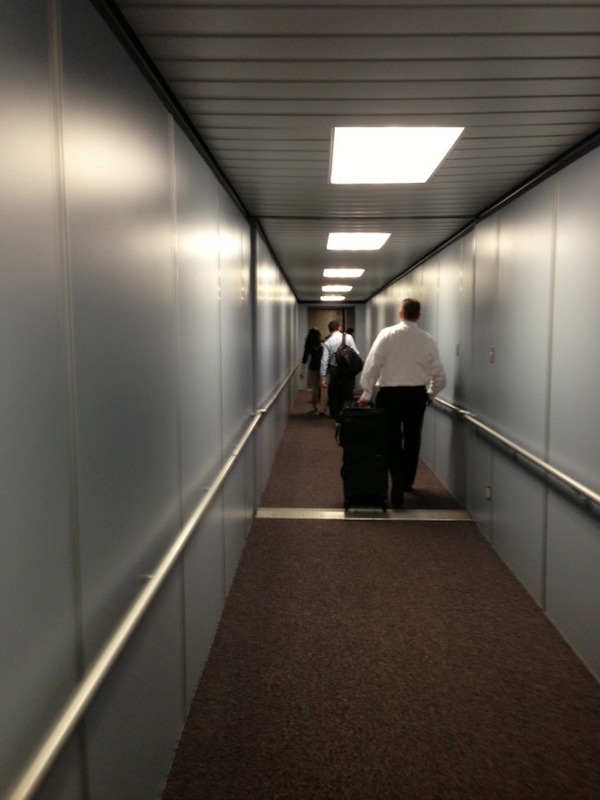 Before we board our flights, the jet bridge is the last place on earth we touch. It is there and gone, and yet remains, awaiting the next flight. When we touch down again, in a familiar or new place, the jet bridge is the first thing we meet. While we may never linger for too long within jet bridges themselves, they are nevertheless things to linger on, to consider the ways that they exist, innocuous moveable connectors with lives of their own. Christopher Schaberg is the Dorothy Harrell Brown Distinguished Professor of English at Loyola University New Orleans and the author of The End of Airports.